August 1, 2018, marks The Guthy-Jackson Charitable Foundation’s 10 Years Anniversary! In 2008, Ali Guthy, daughter of Victoria Jackson, founder & CEO of Victoria Jackson Cosmetics, and Bill Guthy, of the infomercial giant Guthy-Renker, was diagnosed with a little-known disease called neuromyelitis optica (NMO), which causes blindness and/or paralysis. In just 10 years, Victoria’s visionary approach has achieved milestones and elevated the clinical experience for NMO patients by improving options for treatment, prevention and progress toward a cure. 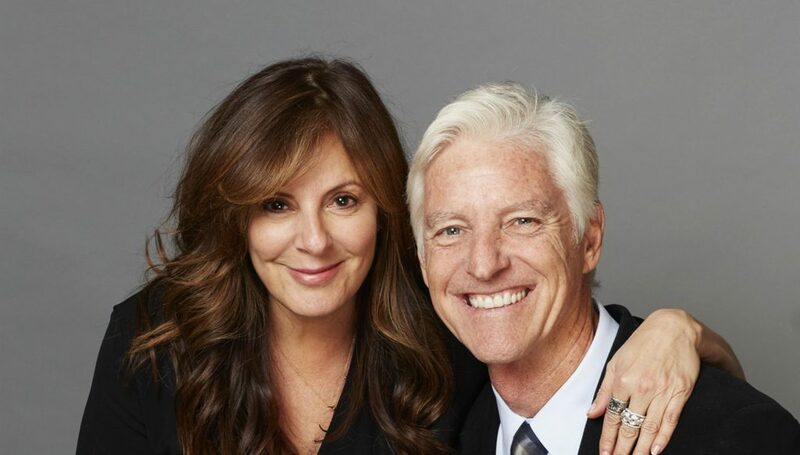 Together, through the foundation, she and her husband have invested more than $55 million in 76 research projects to understand the pathophysiology and biochemistry of NMO. We knew we had to create a foundation to find a cure. Victoria has led the work of the foundation to achieve quantum progress—and at record speed. Today, with the start of industry-sponsored clinical trials and with funding for new NMO research from the National Institutes of Health (NIH), there is real hope—where once the future for NMO patients was uncertain. Indeed, the landscape has altered so meaningfully that recent findings promise that NMO can be solved. And that solution will have vast applications for treating other autoimmune diseases like multiple sclerosis and lupus. In the course of creating, funding and leading the foundation, Victoria has shaped a paradigm-breaking approach to medical research. In addition to connecting 175 innovative problem solvers from 30 countries and even more diverse fields of expertise in an unprecedented model of collaboration, the foundation has created a global community of patients, advocates and healthcare stakeholders, with significant positive impact on the treatment of autoimmune and related diseases. Catalyzed innovative science to find new therapeutic targets and biomarkers. Synergized collaborations and partnerships with industry, private and federal agencies. Facilitated the first-ever NMO clinical trials, with three industry-led Phase III clinical trials in process to test new therapies, and more trials are emerging. Supported the first-ever tolerization trial in NMO patients, representing a breakthrough cure in disease. Formed an International Clinical Consortium for NMO, bringing together multidisciplinary experts from around the world. Published an international consensus paper that rewrote the book on NMO diagnosis, along with 10 state-of-the-art review articles to share the latest discoveries in NMO. Increased NMO’s prevalence by over 250 percent worldwide, with best options for patients who can now receive the best care. Dramatically reduced misdiagnosis of NMO and other “look-alike” autoimmune diseases. Created the CIRCLES Study, the largest NMO-focused biospecimen & data repository, with free access available to investigators for research and over 1,200 participants enrolled. Supported a Pan-African NMO Patient Registry for research. Hosted the first-ever annual conference solely dedicated to NMO, called the “International NMO Roundtable Conference,” going into its 11th year. Hosted the first-ever annual “NMO Patient Day” conference going into its 10th year. Funded national and international NMO conferences and patient days. Online international registry of more than 350 NMO clinicians. Video library comprised of more than 100 videos (PSAs, FAQs, educational, personal stories). NMO Patient Guide, now in its 3rd edition. Educational brochure (print and digital), translated into 12 languages. Interactive multimedia toolkit for education and advocacy. Mobile app offering patients instant information during times of critical need. 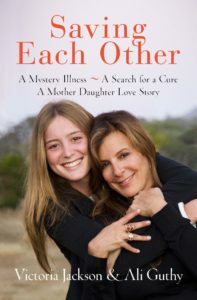 “We always have a choice in how we respond, no matter what life serves up to us,” writes Victoria in Saving Each Other, a book she co-wrote with Ali, which chronicles their incredible journey to not just live with NMO, but to find a cure. Buy your copy of Saving Each Other. All proceeds go to NMO research. 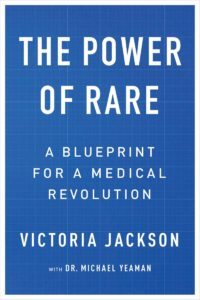 Buy your copy of The Power of Rare, and learn how Victoria’s vision led to a new model to cure disease. All proceeds go to research.